This enquiry deals with the shortcomings of rational choice theory in explaining voter turnout as a rational - i.e. efficient in terms of costs and benefits - act. It is argued that intrinsic benefits, i.e. benefits that accrue to the citizen independent of an election outcome, should provide a proper explanatory potential if one can account for different implications of these benefits for different voters. The rationale should hold for benefits in general, though. Underlying coherent priorities in the form of political values (materialism vs. postmaterialism) are used to differentiate voters and to probe for differing impacts of determinants of voter turnout depending on different underlying values. The thesis is that the impacts of these determinants differ for different values. The tested determinants, taken from the literature, are appreciation of democracy, social norms, party identification and material resources. Hypotheses about impacts are formulated on the basis of the theory of political values for every determinant and tested by means of logistic regression employing data from German election studies. Whereas the impacts of social norms and material resources vary by underlying values, the results for appreciation of democracy and party identification remain inclusive. Why do voters turn out at the poll? This question has been taken on, amongst others, by rational choice theory. Rational choice theory posits that individuals act rationally in the sense that they calculate the benefits and costs, i.e. the utility, of possible actions and choose the one with the highest net returns. This parsimonious and straightforward approach to explaining individual behaviour, scholars have remarked over decades, seems to be out of joint when applied the issue of voter turnout. The crux has been specified repeatedly (see Verba et al. 2000; Laver 1997; Bäck et al. forthcoming; Whiteley 1995). It can be outlined by looking at the basic calculus of voting as formulated by Riker and Ordeshook (1968). The calculus represents the utility of voting and comprises the voter’s probability of being decisive (p) times the expected benefits from the preferred result (B) minus the costs of voting (C). If p times B is smaller than the costs, the utility of voting is negative. It would be irrational to vote. The crucial point in the equation is the generally immensely small probability of the voter being decisive. As a consequence, the benefits of voting are reduced to virtually noting and even very small costs of voting will make turning out at the ballot box an irrational act in this perspective. This holds not only for the act of voting. It is akin to the basic problem of collective action as described by Olson (1965): Because any one individual can expect the benefits of a collectively produced good to accrue to her/him with or without her/his participation, she/he will generally opt not to participate, i.e. she/he will “free ride” (Olson 1965; see also Engelen 2006). In sum, the “rational actor will not participate in politics” (Verba et al. 2000, 243). This is seen as the “paradox that ate rational choice theory” (Fiorina 1990, 334) or “the major example of the failure of rational choice theory” (Aldrich 1993, 247). A vast number of accounts for explaining voter turnout and solving the “paradox” have been given. A major contribution in this line has been provided by Riker and Ordeshook (1968) who consider the calculus presented above incomplete. They added a D-term that refers to benefits independent of the election outcome. These benefits can be called intrinsic (Riker/Ordeshook 1968) or expressive as opposed to instrumental (Brennan/Hamlin 1998; Brennan/Lomasky 1993). Introducing these kinds of benefits requires a certain notion of rational choice. Whereas the idea of a “thick rationality” (Ferejohn 1991, 282), demanding assumptions about the nature of actors’ beliefs and interests, is no longer applicable, a “thin rationality” (Ferejohn 1991, 282), that does not stipulate any assumption about the substance of actors’ preferences, is still viable. The suggested solution of employing intrinsic benefits in explanations of voter turnout did not rest easy with several authors. For Laver (1997, 94), the named approach can not really be considered an explanation. Whiteley, commenting on participation modes that are associated with high costs, regards intrinsic benefits as inconsistent with a rational choice framework, too (1995, 218). He concedes, though, that without these supposedly inconsistent factors, no firm explanation can bee given (Whiteley 2006, 227). According to Verba et al. the broader approach including intrinsic returns “offers little explanatory bite since almost any gratification can fit under the rational umbrella, and the theory becomes nearly impossible to falsify” (2000, 246). However, they conclude that a narrow - one might also say “thick” - notion of rational choice is insufficient while the broader - or “thin“ - and supposedly tautological conception seems to fit actual phenomena better (Verba et al. 2000). With regard to that last point, Engelen advances a similar view: “It is only within an exclusively instrumental account of human behaviour that voting becomes a mystery” (Engelen 2006, 420). This outline points to a major predicament. While broader concepts of rationality seem to be inevitable for sound explanations of voter turnout, they are also prone to being tautological within a rational choice framework. A possible remedy is already offered by the literature. Verba et al. themselves have identified the crucial question: “If people act from civic virtue [which constitutes an example of intrinsic benefits, P.K. ], the interesting questions that follow are: which individuals act from civic virtue and for what reasons” (2000, 267)? Similarly, Ferejohn and Fiorina have pointed out that one has to explain, why the D-term, why intrinsic benefits have an effect on some voters but not on others (1974, 526). Consider as well Geys who states that explanations of turnout by means of benefits unrelated to the outcome tend to “be tautological unless we can identify the reasons why some people wish to express a preference and others do not” (2006, 19; emphasis in original). The focus of the paper at hand lies on the issue that was just outlined. The paper is intended to offer a contribution to explaining voter turnout. Against the background of the huge challenge, implicitly also delineated above, it can only make a small leap in this direction. Nevertheless, it should at least allow a glimpse of what lies beyond the notion of intrinsic benefits and these benefits’ differences in affecting citizens. In order to do so, the paper at hand draws on the theory of political values by Inglehart (1977; 1997). Inglehart has introduced the concept of materialist and postmaterialist values. These value orientations subsume a number of attitudes and represent priorities among certain goals held by individuals (1981a, 78; 1981b, 292). They can thus be conceived as some kind of prism where preferences are combined in particular ways, a lens through which actors assign costs and benefits. Such bundles of preferences may imply differing and relatively coherent operations of discounting and valorising available options. This concept should therefore be suitable for generating oppositional hypotheses about benefits accruing to voters and discovering possible trade-offs in the sources of benefits. Following the authors cited in the preceding paragraph, the research question can be stated as follows: Can different sets of valorisations and devaluations supposedly associated with materialist or postmaterialist orientations respectively explain differential impacts of sources of intrinsic benefits from voting? If different patterns of preferences, implied by different political values, lead to different influence levels of determinants of voter turnout, they should do so for intrinsic as well as for other kinds of returns. The question can thus be extended to benefits in general. Although the crucial problem has been depicted with regard to intrinsic benefits, the aim is to shed light on whether using a tight structure of priorities - in the form of political values - can help to refine rational choice explanations of voter turnout. The thesis put forward in this paper is that postmaterialist voters are affected differently by (intrinsic) returns compared to materialist voters. 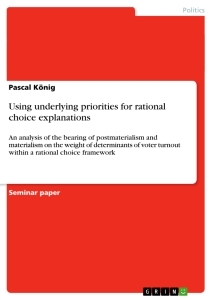 This requires taking a look at rational choice approaches to voter turnout as well as including the main propositions about (post-) materialist values. Connecting the both approaches renders it possible to specify the above- mentioned thesis in the form of how exactly determinants of voter turnout should differ between materialists and postmaterialists. Drawing on survey data from German election studies, the analysis examines four determinants of voter turnout which, it will be argued, should differ in their impact for materialist and postmaterialist voters. These determinants are social norms, party identification, instrumental party identification, material resources and appreciation of democracy. All five of them are or are related to rather basic explanations of voter turnout in the rational choice literature and they are suited for being linked to the theory of political values. While social norms, party identification and appreciation of democracy are included as intrinsic benefits, material resources and instrumental party identification are adopted in order to attain a more differentiated result. The proceeding will be as follows. The subsequent section two elaborates on the theory of postmaterialism. Section three presents a selection of suggested explanations of voter turnout, i.e. some attempts to salvage rational choice from the above-mentioned paradox. The subsequent section four formulates hypotheses about the weight of the determinants of voter turnout based on the depiction in section three. Section five contains the operationalization of the variables. The results are presented in section six. After a short discussion and interpretation of the findings in section seven, this paper will close with the conclusion. This section shall give a brief outline of the theory of political values by Inglehart, take account of criticism put forward in the literature and present cases where the theory of political values has been used in conjunction with political participation and voting in particular. Inglehart (1977) has hypothesized that a fundamental change of values would take place in modern industrial societies. Citizens’ values would shift from materialist values, based on economic and physical security to postmaterialist values, emphasizing self- expression, belonging, aesthetic, social needs and individual autonomy (Inglehart 1977; Inglehart/Welzel 2005, 97; Inglehart 1997). Inglehart (1977; 1997; also Inglehart/Welzel 2005) ties his explanation of value change to two hypotheses. The scarcity hypothesis states that every individual adheres to an identical hierarchy of needs. Individuals will place the most pressing needs before any other goal. That means, once physical security is met, one can afford and will tend to turn one’s attention to other goals. “[W]hen material needs are securely met, they tend to be taken for granted and postmaterialistic goals receive higher priority, widening people’s horizon for higher goals on the Maslowian (1954) hierarchy of motivations” (Inglehart/Welzel 2005, 98). The second hypothesis is called socialization hypotheses. The preadult years are presumed to be a formative period. Values, acquired in that time will be very persistent for the rest of one’s life. Which values an individual prioritizes in this formative period, depends on the socioeconomic conditions during this time (Inglehart/Welzel 2005, 98). What forms the crucial aspect of the theory about value change is the presumption of an interaction between the two hypotheses: “[T]he scarcity hypotheses must be interpreted in connection with the socialization hypothesis” (Inglehart/Welzel 2005, 98). Conditions of prosperity are considered conducive to making postmaterial values take priority. Socialization under these conditions then makes the acquired values persist throughout one’s whole life. As a consequence, a shift from materialist to postmaterialist values can not occur in the short term. It occurs instead in the form of an intergenerational change, where, put bluntly, one generation, socialized with postmaterial values, replaces an older one which adheres to material values (Inglehart/Welzel 2005, 100-107). The theory has been discussed extensively and incurred several criticisms. Researches have challenged the validity and the assumption of one-dimensionality of his concept of postmaterialist and materialist. According to Giacalone and Jurkiewicz (2004), more robust measures can be obtained by introducing interaction effects between materialism and postmaterialism. Davis and Davenport (1999), putting Ingelhart’s measure of postmaterialist and materialist values to a test on the individual level, call intro question the validity of Inglehart’s standard measure. They conclude that the respondents’ self-evaluation results into a distribution of materialist, postmaterialist and mixed types close to one that would be expected from a random choice. The study by Giacalone and Jurkiewicz (2004) is another case that calls into question the one-dimensionality of the materialism-postmaterialism concept. The authors have developed a modified materialism-postmaterialism scale which included possible interaction effects between materialist and postmaterialist orientations. Their findings show support for the presumed interaction effect and suggests a better prediction of dimensions of social and personal identity by their scale (Giacalone/Jurkiewicz 2004, 190-196). Similarly, Bean and Papadakis (1994) have argued and shown empirically that postmaterialist and materialist values are not necessarily strongly opposed to each other. Other authors have deemed Inglehart’s standard measure of (post-) materialism inadequate in the sense that the measuring of respondents’ subjective importance of inflation rates - as a commonly used indicator for materialism - may underestimate materialist orientations in times of low inflation rates (Clarke/Dutt 1991; Scarbrough 1995, 130-132). Clarke and Dutt argue that with the crowding out of the issue inflation rates by unemployment Inglehart’s measure should tend to artificially increase the proportion of postmaterialists (Clarke/Dutt 1991, 917-918). This argument is not only a criticism of Inglehart’s concept on a theoretical level but also brings forward an empirical challenge to the political values concept. Other enquiries have dealt with the empirical aspect more conspicuously. Duch and Taylor (1993) launched the criticism that a value change in modern societies is not so much induced by change in economic conditions but significantly affected by (rising) educational levels. Moreover, Bauer-Kaase and Kaase note that nothing certain can be said about the stability of citizens’ political values over time (Bauer-Kaase/Kaase 1998, 257). One should not miss the fact that the theory of political values has been discussed extensively. In the course of such a scientific discourse, resulting criticism is almost inevitably linked to the weight of an approach. Inglehart has been steadily sticking by his approach and beneficial applications of his concept can be found. Inglehart and Abramson have examined value changes in twenty societies and conclude that “the basic four-choice battery has performed remarkably well” (1994, 350). This is corroborated by the works of Inglehart and Welzel (2005). Furthermore, the fact that the postmaterialism-materialism concept has been gainfully used in a number of studies, some of which are concerned with political participation, suggests a certain usefulness of the concept. Yet, the above-mentioned qualifications of the theory of political values should be kept in mind when looking at findings of the studies in area of political participation. Bekkers (2005), for instance, investigates determinants of civic engagements in voluntary organizations. Among other factors, postmaterialism, he concludes, has a positive effect on civic engagement (Bekkers 2005, 451). Opp (1990) includes postmaterialist values in collective action model to test hypotheses about the effects of factors in this model on legal and illegal forms of protest. Based on data derived from opponents of nuclear energy in West Germany, his results show that postmaterialism is only significantly correlated with legal protest. The effect of postmaterialism on this type of protest is relatively small compared with other variables and negligible with regard to illegal forms of protest (Opp 1990, 282-229). In these studies, postmaterialism/materialism has been taken as a factor that can have an effect on particular forms of political participation. In this line, other studies have dealt with political values in the realm of elections and voting. Fuchs and Rohrschneider (1998) have conducted a study on postmaterialism and electoral choice in the German context after German unification. They show patterns of voters’ choices of parties depending on whether the voter holds materialist or postmaterialist values. They show that the Greens attracted increasing shares of postmaterialist voters until 1994. A corresponding examination for the period from 1976 to 1987 and for West Germany can be found in the study by Conradt and Dalton (1988). Their results show a similar trend as presented in the study of Fuchs and Rohrschneider. The Greens received, on the whole, growing shares of votes from postmaterialist citizens and “drew postmaterialists away from the Social Democrats” (Conradt/Dalton 1988, 12). Another study by Crepaz (1990) is more closely related to the issue of voting. He employs postmaterialist/materialist values in a comparative analysis between several countries and argues that general polarization of the party system and the existence of postmaterialist parties increase voter turnout. His main argument in this line can be stated as follows: “In a rich and diverse political landscape electors have more opportunity to identify themselves with ‘their’ party which stands for ‘their’ cause” (Crepaz 1990, 200). He tests and confirms the assumption that these two factors have an impact on voter turnout. Since Crepaz uses a model of political space and sees parties as some sort of ideological product (Crepaz 1990, 184), his predictions may also be adopted by a rational choice framework. The paper in hand, though, does not aim to investigate postmaterialism/materialism in a model of policy space where postmaterialism would constitute one dimension. Crepaz’ work nevertheless points to a connection between postmaterialism and voter turnout. Brown and Carmines (1995) examine the effects of economic and Noneconomic issues for postmaterialist and materialist citizens in a number of presidential elections in the USA. Brown and Carmines find that postmaterialists and materialists do not seem to use different criteria for choosing a president: Noneconomic and economic issues do not differ in their impact on presidential choice for materialist and postmaterialist voters (Brown/Carmines 1995, 487-492). To sum up the presented findings on postmaterialism/materialism in conjunction with voting: Studies on postmaterialism and voting have so far examined postmaterialist and materialist values linked to electoral choice under rationalist assumptions, connected these values to voter turnout and explored the impacts of determinants of voters’ choices for postmaterialists and materialists separately. But no study is known to the author, where determinants of voter turnout are investigated for postmaterialist and materialist citizens within a rational choice framework. Before this task is tackled and implications of postmaterialism/materialism on (explanations of) voting can be given, one first has to take account of rational choice explanations of voting, discussed in the literature. This is the subject of the following section. There have been a number of suggestions to solve the problem of rational choice theory of explaining voter turnout. This section shall give only a selection of approaches designed to cope with this issue (for an overview see Dowding 2005; Engelen 2006; Geys 2006; Laver 1997; Whiteley 1995). The grounds for selecting the explanations below are how well they can be joined with the concept of political values. This theory, outlined in the preceding section, will be employed to formulate hypotheses on the impact of factors, suggested in the explanations to solve the ‘paradox’ of voter turnout. Yet, not any such explanation to be found in the literature can be drawn upon for making named conjectures about the impact of their variables. Thus, the following set of approaches to explaining voter turnout is chosen with respect to the possibility of making reasonable assumptions about their impact. The choice of approaches should become clearer in the next section four, which contains hypotheses derived from connecting the theory of postmaterialist values with the rational choice explanations. These rational choice explanations shall be addressed now. First, one solution to the paradox of rational choice can be derived from what Downs (1957) already wrote about the causes of voting/abstention. He offered another source of returns from voting that is not based directly on the election outcome in terms of who has won, the value of voting per se. Downs (1957, 268) considers voting as a form of insurance against the brake- down of democracy, the latter being deemed as beneficial to its citizens. “The advantage of voting per se is that it makes democracy possible” (Downs 1957, 261; emphasis in original). Das Wahlparadox: Eine (un-)lösbare Aufgabe für Rational Choice? Stößt die Rational-Choice-Theorie mit dem Wahlparadoxon an ihre Grenzen? Bietet die Rational-Choice-Theorie im Bezug auf das Wahlparadoxon überzeugende Lösungsansätze?